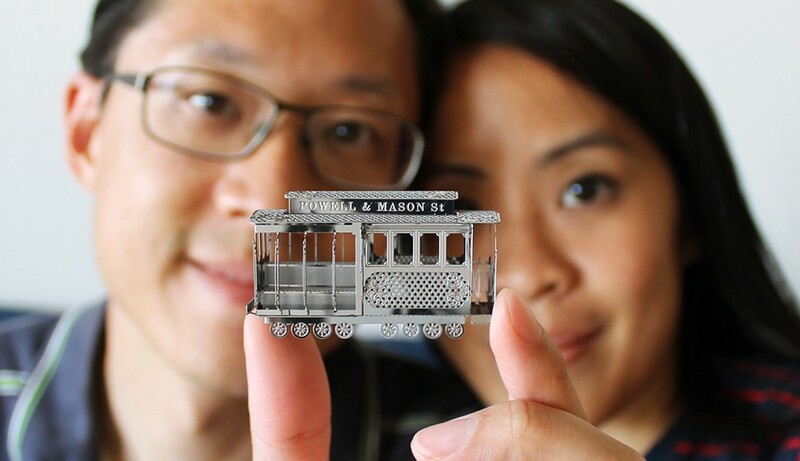 Lily recently traveled to the golden city of San Fran for a conference, and she brought us back an exciting souvenir: a laser-cut 3D metal model of a classic San Francisco cable car! 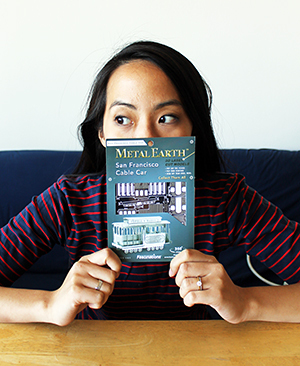 It’s from the Metal Earth series by the toy company Fascinations. Last time Silas and I were in San Francisco, we visited the SF Cable Car Museum and learned that the famous SF system is the only one that still operates entirely manually. Three of the 23 original lines established in the late 1800s comprise the current SF system. Other than in SF, we’ve only ridden cable cars in a few other cities including Las Vegas and Toronto. Like the SF cable cars, these run alongside street traffic; however, these are not traditional – they are fully automated, allowed the right of way, and not intended for mass transit (though admittedly even in SF cable cars are more for tourists than commuters nowadays). In general, the popularity of cable cars never became widespread because of the introduction of electric streetcars soonafter. In SF, their persistence and survival may be attributed their mechanism of traction locomotion. Notoriously steep areas of the city were more conducive to cable car than electric streetcar. Now SF cable cars are listed in the National Register of Historic Places. 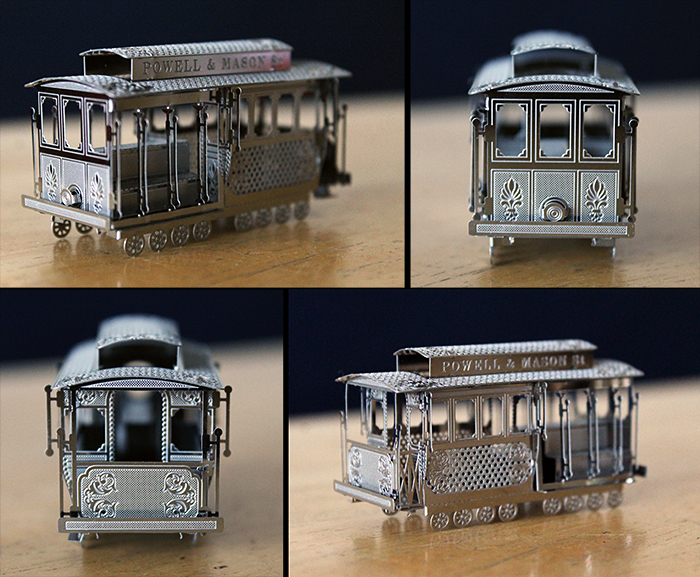 The eleven pieces of the SF cable car model from Lily were contained completely on a single sheet of steel. For assembly, we decided to wear latex gloves to minimize fingerprints, especially on the inside of the cable car which would be inaccessible in the final product. 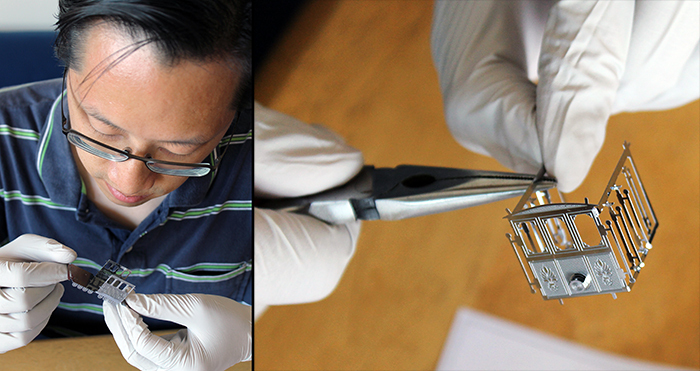 Each component piece of the model was supported at two or three points within the metal sheet. They popped out easily with little effort. The instructions were entirely pictorial and easy to follow. Some pieces required folding along fine scores in the metal; others required bending. The pieces fit together seamlessly by a simple tab system. If a piece had a tab, the corresponding receiving piece had a slot for the tab. After positioning the pieces together, the tab was then twisted or folded to keep the pieces together. We used our fingers or needle-nosed pliers for assistance. Here is the finished San Francisco cable car! The entire 3D model is approximately 2” x 1” x 1”. 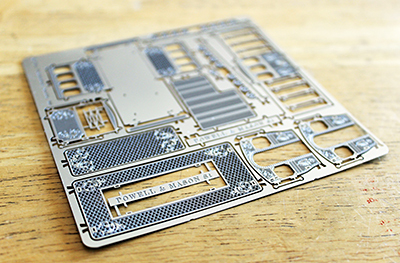 You can see the intricacy of the detailing on each piece, thanks to the laser-cutting technique. These details were even more beautiful given the small scale. Thanks, Lily, for your thoughtful gift and for an afternoon of fun!